Little Rock High School, now Central High School National Historic Site, is a national emblem of the often violent struggle over school desegregation. Parting the Waters author Taylor Branch calls the Little Rock crisis "the most severe test of the Constitution since the Civil War." Three years after the Supreme Court’s Brown v. Board of Education decision, which officially ended public-school segregation, a federal court ordered Little Rock to comply. On September 4, 1957, Governor Orval Faubus defied the court, calling in the Arkansas National Guard to prevent nine African American students — “The Little Rock Nine” — from entering the building. Ten days later in a meeting with President Eisenhower, Faubus agreed to use the National Guard to protect the African American teenagers, but on returning to Little Rock, he dismissed the troops, leaving the African American students exposed to an angry white mob. Within hours, the jeering, brick-throwing mob had beaten several reporters and smashed many of the school’s windows and doors. By noon, local police were forced to evacuate the nine students. When Faubus did not restore order, President Eisenhower dispatched 101st Airborne Division paratroopers to Little Rock and put the Arkansas National Guard under federal command. By 3 a.m., soldiers surrounded the school, bayonets fixed. Under federal protection, the “Little Rock Nine” finished out the school year. The following year, Faubus closed all the high schools, forcing the African American students to take correspondence courses or go out-of-state for schooling. The school board reopened the schools in the fall of 1959, and despite more violence — for example, the bombing of one student’s house — four of the nine students returned, this time protected by local police. "Little Rock Central High School National Historic Site". We Shall Overcome: Historic Places of the Civil Rights Movement. National Park Service. https://www.nps.gov/nr/travel/civilrights/ak1.htm (Accessed November 16,2018). 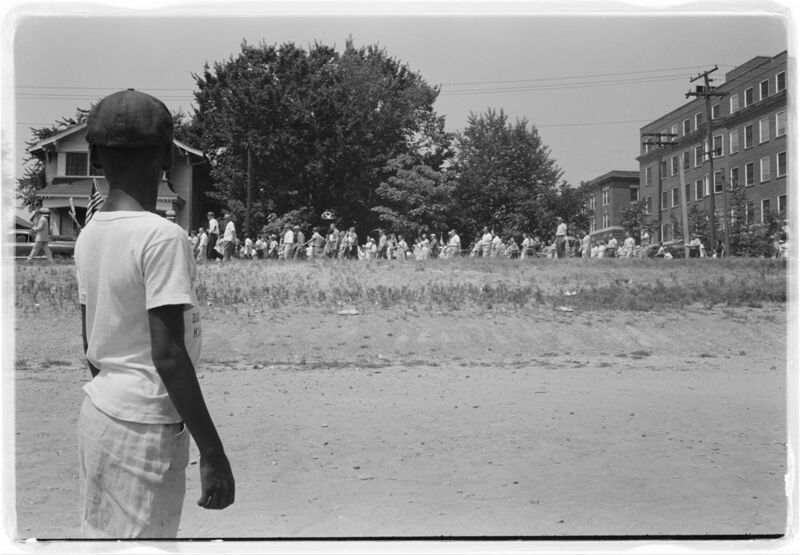 A boy watches protesters march to Central High School in Little Rock after federal courts order its integration in 1957.